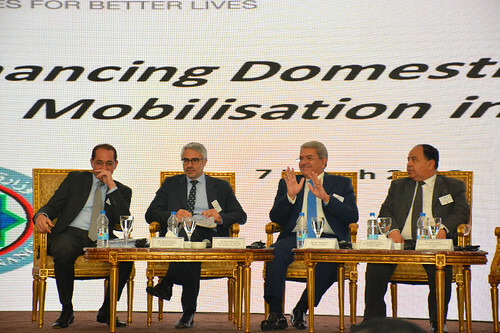 07/03/2018 - During a stakeholders meeting on International Tax Reform in Egypt on 7 March 2018 in Cairo, the Ministry of Finance and the Organisation for Economic Co-operation and Development (OECD) launched a programme on "Enhancing Domestic Resource Mobilisation in Egypt through a better tax and exchange of information system". The project, financed by the European Union, provides EUR 1.2 million in funding over two and a half years, and will assist Egypt in the implementation of the new international standards to tackle tax avoidance and tax evasion. Since July 2016, Egypt became an active member of the Inclusive Framework on Base Erosion and Profit Shifting (BEPS), which brings together 113 countries and jurisdictions on an equal footing to tackle international tax avoidance, in particular preventing tax treaty abuse and introducing country-by-country reporting for the activities of multinational enterprises. In August 2016, Egypt also became part of the Global Forum on Transparency and Exchange of Information where 148 members work on an equal footing ensuring the implementation of the international standards for transparency and exchange of information in the tax area, a key element in the fight against illicit financial flows. Most recently, Egypt joined the Revenue Statistics in Africa project which will result in standardised indicators on government revenues and will enable comparison with other countries. Mr. Mohamed Moeit, Vice-Minister of Finance for the Public Treasury Affairs. The stakeholder meeting brought together over 100 participants from government, the Egyptian Parliament, the media, embassies, business and chambers of commerce, development banks and international organisations. In his welcome address, Egypt's Minister of Finance, H.E. Amr El-Garhy highlighted the recent developments under the fiscal reform which focuses on a stable and clear tax policy as key for attracting investments, creating job opportunities, supporting GDP growth and Sustainable Development Goals. The representative of the European Union, Mr. Angel Gutierrez-Hidalgo, Head of the Economic Cooperation at the EU Delegation in Egypt appreciated the government’s economic reforms in the taxation area and underlined the contribution of the programme to improve transparency, efficiency and fairness of the tax system in Egypt. At a panel discussion, Ahmed Kouchouk, Egypt's Vice Minister of Finance for Fiscal Policies and Institutional Reform, shared the latest updates and milestones of the Egyptian tax reform and emphasised the importance of the collaboration with the International Organisations, in particular the OECD and the EU as a stepping stone to continue developing Egypt’s tax practice and its leading position in the region. Mr. Pascal Saint-Amans, Director of the OECD's Centre for Tax Policy and Administration stressed the importance of support to emerging countries and welcomed Egypt's tax reform efforts and its active role in international tax co-operation. As part of the programme and the current visit to Egypt, the OECD will hold bilateral meetings with senior representatives from the Ministry of Finance and Egyptian Tax Authority (ETA), Members of Parliament, and business representatives to discuss the international tax reforms in Egypt. Tax officials from the Ministry and ETA will also participate in a workshop facilitated by the OECD on the implementation of measures to tackle BEPS in Egypt. Ahmed Kouchouk, Vice Minister of Finance for Fiscal Policies and Institutional Reform. Ayman Elsherbiny, Press Officer, European Union Delegation. Pascal Saint-Amans (+33 1 45 24 91 08), Director of the OECD Centre for Tax Policy and Administration (CTPA) or the CTPA Communications Office.